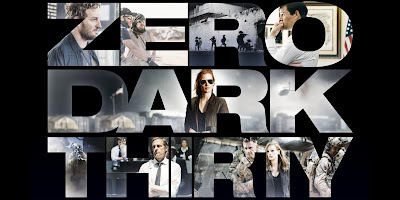 PLOT: Zero Dark Thirty recounts the pursuit and capture of Osama bin Laden, the Al Qaeda leader held accountable for the events which took place on September 11, 2001.
REVIEW: It doesn't matter that you already know Point Z, President Obama announcing to the world that Osama Bin Laden had been tracked down and killed by American forces. It's Point A through Point Y that make Zero Dark Thirty, the film that lays out the steps of the greatest manhunt in US history, such a pulsating and intense story. It's the first-rate direction from Kathryn Bigelow that makes this telling of this story so fantastic. 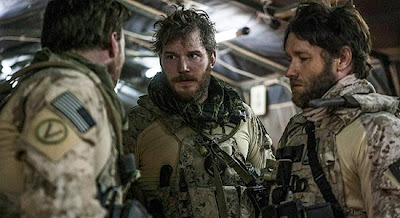 Marrying fact with presumed estimations, and never letting on which is which, it transcends its procedural framework, making Zero Dark Thirty one of the finest cinematic achievements of 2012. Read on! Leading an all-star cast of CIA operatives, company men, and soldiers is Jessica Chastain as Maya - probably not the real person's true name - an analyst who comes into the hunt for Bin Laden mid-interrogation. Maya has some getting used to the tactics being used, but it isn't long before she has made it her mission to find and take out the top Al Qaeda member while pencil pushers are concerning themselves with when the next attack is going to take place. It's a grueling task for the young analyst, but as history tells us, her actions ultimately pay off. It's in the grueling task that director Bigelow and screenwriter Mark Boal find their story. Procedurals aren't often successful. 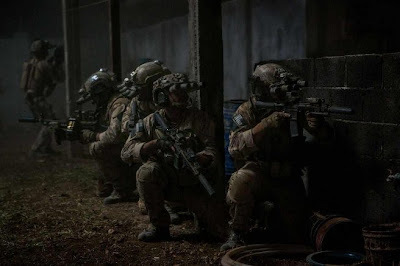 They rarely have the flesh or weight behind them to allow the audience to truly engage with their characters, but the nature of Zero Dark Thirty almost makes it a necessity. We aren't meant to know the real identities of these people. We shouldn't know what their home life or families are like, just the painstaking determination of the individuals behind the mission. To make the mission as real as possible seems to have been priority for Boal and Bigelow, who collaboratively made boots on the ground so tense in 2009's The Hurt Locker. And the success of The Hurt Locker's naturalism is clearly what made Boal and Bigelow the perfect choices to bring the Zero Dark Thirty story to life. Though the torture scenes are nothing we haven't seen before - 24 had a nice hand in making water-boarding seem like a trivial form of persuasion - the strength of their execution cannot be denied. Each location, every room, all that Bigelow puts on the screen cries realism, and if even a coffee cup is out of place, only true CIA agents would know for sure. The story moves quickly. It has to, having to cover nearly a decade in just over two and a half hours of screen time. The writer/director team do a masterful job incorporating the main breaks, subsequent terrorist attacks after 9/11, and encumbering politics that would eventually put Bin Laden in a body bag. All of this leads to those final moments, when soldiers stormed Bin Laden's compound under cover of night, and if the first two hours of Zero Dark Thirty are intense, the final act is one, continuous chill down the spine of the audience's back. The rest of the cast is equally convincing with performances from Mark Strong, Joel Edgerton, Chris Pratt, and Kyle Chandler standing out. However, it's Jason Clarke as an interrogation specialist who gives Chastain the only run for her money in the film. He's somber, quiet, almost reflective in the moments when he's not trying - and succeeding - to be intimidating. It's only during a moment Clarke shares with a monkey and an ice cream cone that shows a comedic side and proves that a full movie about the ins and outs of his character would be extremely welcome. But that would go against the enigmatic nature of this intense and very realistic procedural. The best stories about history let you in on the finale but still keep you invested all the way through, never letting the knowledge of its outcome put a damper on something truly remarkable. 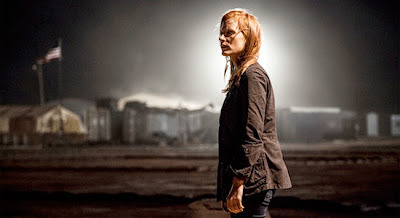 Zero Dark Thirty is just such a story, and with a first-rate screenplay, faultless direction - In all her able years behind the camera, athryn Bigelow has never been this impeccable - and the best single performance of the year, it's an irreproachable film from start to finish.